Where the heart feels at home! Puerto Baquerizo Moreno, the capital of San Cristobal and the second largest population in Galapagos, offers travelers a variety of hotels, shops, and bars and restaurants to choose from. A popular beach, and the main one for swimming, is Playa Mann which is a white sand beach with clear blue water. Playa Carola is a surfing hotspot where the waves are most excellent during the warm-wet season. Another surfing site is located west of the island, Tongo Reef, where the best surfing season in during the wintertime. If you want to know a lot more about the Galapagos and its ecosystem, the Interpretation Center is a great place to fill up on information. This visiting center is dedicated to sharing the history of its volcanic birth to the recent happenings of the islands. You can learn about the flora and fauna, enjoy activities, workshops, and exhibitions. After, a route from the center leads to Frigate Hill where you can find both Great and Magnificent Frigate birds nesting together. For a nice day out at sea, Isla Lobos is just an hour ride by boat from San Cristobal. Snorkeling is a relaxing activity alongside colonies of sea lions and fur seals. And after, Ochoa Beach is close by where Ghost and Hermit crabs lurk the rocky coast, and sea urchins can be observed. This island in particular is one of the most beloved and visited by travelers due to its abundance of native wildlife. One popular visiting site, Punta Suarez, is known for its warm greetings from sea lions lounging around the landing dock. 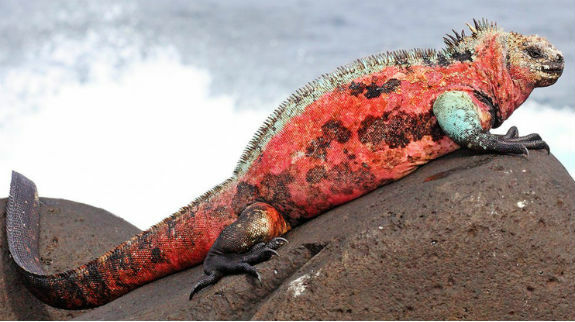 Here is where brightly-colored green and red iguanas–exclusively the only marine iguanas that maintain their bright colors all year round– can be found on the coast. One special focal point of the trip is the excursion of the Waved Albatross breeding colony between the months of April to December, where you will find around 30,000 birds performing their mating dances to impress and partner up for life. A couple of other nice sites for marina lovers and divers; Visiting Tortuga Rock and Gardner Island is a great chance to see very unusual and unique tropical fish such as the Bump-head Parrotfish and the Yellow-tailed Surgeonfish. With hidden underwater caves, expect to see many other maritime fish, different species of invertebrates, and new worlds waiting to be explored. With a population of roughly 100, this small town is mainly dedicated to agriculture. The main transportation to Floreana are by boats that depart every two weeks from Santa Cruz island. Although a quaint city, it possess two gorgeous beaches, one being Flour beach where the sand is made up of pulverulent coral–here are nesting grounds of some Green Sea Turtles. The second is ultimately unique because of its green sand beach, of which is actually because of the olivine crystals found there. Cormorant Point is the primary feature of Floreana–the local lagoon where visitors can get a real close up of flamingos delving into the muddy water in order to feed, along with Large-billed Flycatchers, Pintail ducks, and a few species of Darwin finches. Twenty minutes from Puerto Velasco Ibarra, travellers can visit Cerro Alieri. In this area of the highlands, there are over forty-eight distinct varieties of plant life. The main plant, and was thought to be extinct, is the Linum cratericola. It was rediscovered in the year of 1997 and continues to be a critically endangered plant. The second highland site is in Asilo de la Paz which is a 45-minute ride from the port city. The fundamental source of water is a freshwater spring and tourists can catch a glimpse of the pirate caves. For other existing caves and intriguing rock formations, the islets The Bottle, Champion, Enderby, and Watson offer views by boat or by Dinghy. There is also high chance to check out the variety of aquatic fish, sea lions, and turtles of the area. The island is reached by boat where visitors will begin with a wet landing in Barrington Bay, and occasionally welcomed by sea lions surfing the waves and soaking up the sun. One trail around the beach is short, but permits exceptional close-ups of monumental Opuntia Cacti. The second trail being the longest leads to an elevated cliff that shows off the interior of the island. Marine sites located in the northern and eastern parts of Santa Fe–EL Fondeador, La Encanada, and Costa Este–are attractive diving sites while on a visit. Due to its close distance from the Baltra airport, Santa Cruz is the main hub for tourists. Travelers have the option of using the ferry that picks-up at the airport and travels down the Itabaca Canal, working its way down to the southern coast at Puerto Ayora–the largest city of the island. For those looking for day tours, Puerto Ayora has many to choose from–hiking, horseback riding, kayaking, island trips, visiting centers, etc.–you name it, they got it! For unique experiences, Bellavista and Santa Rosa are towns that have hiking trails to travel on foot or by horseback and access to underground lava tubes that can be walked through. The more complicated ones are larger, which the only form of entrance is by using ladders. One honorable mention is the visit-worthy Black Turtle Cove–a nice refuge on the north coast of Santa Cruz where calm waters provide a nice atmosphere for Galapagos white-tipped and black-finned sharks; lava herons; and sometimes spotted rays. Another visiting site is Garrapatero–a white beach about 20 km of Puerto Ayora and nearby is shallow water lagoons. Garrapatero is perfect for camp-goers which can be done by requesting a permit from the park. With its unique, seahorse-shape composed by six shield volcanoes, Isabela is the largest of all Galapagos Islands. Due to its various multiple volcanoes, visitors are guaranteed excellent displays of the results of mother nature’s force. Fauna on the island is exceptional as the Cromwell current provides nutrient-rich feeding supply for dolphins, fish, and birds. Also, its a popular ground site to spot over some 16 species of whales like humpbacks, orcas, and sei. If you’re looking for white, sandy beaches, Puerto Villamil is a must-visit. Relatively a 2km walk to semi-salty water lagoons, these are the best locations to spot migrating birds: long beaked whimbrels, black-necked stilts, and bright, pink flamingos. On Isabela, travelers have two options to see volcanoes in the archipelago. The site easiest to reach is the Volcan Chico on the northern side of the island. Here, there are somewhat recent lava flows to walk on and higher views of other volcanoes of the island; Fernandina is also in site from this point. Once this excursion is done, visitors have a choice to continue on an extended hike to visit fumarole where sulfur has been formed into crystals for at least a thousand years. Option two is a longer trek, and horseback riding as a great perk, visiting volcano Sierra Negra. This 45 minute drive from Villamil plus various hours on horseback takes you to the second largest caldera in the world. Named after the British naval officer and second-lieutenant aboard the HMS Beagle, this is an infertile islet in the Sullivan Bay just the east of Santiago island. Bartolome island is also home of a volcanic cone, Pinnacle Rock; formed when magma expelled out of an underwater volcano, cooled by the sea water and causing it to explode. The 600m trail to the 114m summit of multiple blankets of basalt is a spectacular view point for many travelers to observe tuff and spatter cones, the black lava flows to the islands of Santiago, Daphne Major and Daphne Minor, and also Galapagos penguins, herons, and Galapagos hawks for fellow birdwatchers. Another interesting element to look out for is the tequila plant–due to it being covered by tiny, gray hairs, this helps reflect sunlight as to avert moisture evaporation. Swimming and snorkeling are allowed activities many can enjoy on the northern beach. 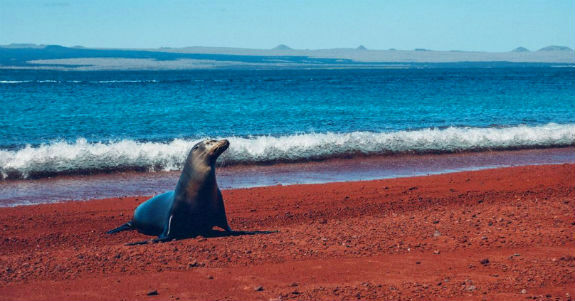 Visitors can enjoy the luxury of swimming with sea lions, Galapagos penguins, and fish of many colors. There is a great deal of sightseeing to be done on the south side of the beach–spotted eagle rays, black-tipped and white-tipped sharks. Also, in the months of January through March, it is a great time to witness the green sea turtle nesting grounds. This small island is covered in rocky terrain and volcanic craters. Its unique, reddish color is the result of the rich volume of iron in lava. Its marine site on the northern edge of the island is a delightful place to dive and has many varied species like eagle rays, garden eels, sea turtles, and at times, you can find penguins and sharks roaming around. Another special detail about Rabida Island that distinguishes it from the others are the fur seals that colonize its beach. Just behind the beach, resides the nesting colony of Brown Pelicans, and Nazca and Blue-footed boobies can be spotted above in the cliffs. In the lagoons of Rabida, flamingos indulge on pink shrimp and crustaceans, and stilts and pintail ducks can also be seen feeding in the shallow waters. Part of the vegetation on Rabida are the indigenous Palo Santo trees of which their resin and oil in its wood gives off a nice scent, therefore, used to make incense and used to ward off negative energies and evil spirits. Other local plant life are different types of bushes and Opuntia Cacti. Santiago is a frequently visited island by many cruise ships and independent tourists. James Bay provides a variety of places to visit with each one containing its own unique quality. A popular visitor site is Playa Espumilla where sea turtles enjoy nesting. Numerous paths lead to the inland and around the island where land birds inhabit the barren terrain. The trail through Puerto Egas takes you to fur seal caves and a salt mine volcano–a crater is located on the volcanic cone of which has a lagoon where flamingos, Galapagos hawks, and other birds feed. Sullivan Bay has one-of-a-kind, architectural structures made from recent lava flows. The pahoehoe lava is covered by pyroclastic cones and yellowish-red tuff cones emerge from the flat flow. Sombrero Chino–or Chinese Hat due to the shape of the volcanic cone viewed from the north–is just southeast of Santiago. Its aquamarine water makes it an impeccable snorkeling spot with chances to see penguins, sharks, and stingrays. Known for its well-deserved fame as “The Bird Island”, Genovesa has plentiful nesting grounds for a diverse species of birds. One particular bird that you can find running around and altogether are the Red-footed Boobies. Some others found on the island are the Swallow-tailed Gulls, Red-billed Tropic birds, Nazca, mockingbirds, and many more. Landing on a small coral beach in Darwin Bay, visitors begin a short hike through woodlands and alongside a lagoon that eventually leads to a slope overlooking Darwin Bay. Yellow-crowned and lava herons are common companions during the trek, along with Lava Gulls and nocturnal Swallow-tailed Gulls. Darwin Bay has an astonishing snorkeling site in the nutrient-rich waters just by Prince Philip’s steps and pretty much everywhere else on the beach. Keep an eye out for hammerheads, sea turtles, sea lions, and infrequent visits of rays! Consequently, numerous amounts of geological activity has raised these parts of the island resulting in bared mangroves and coral reefs. 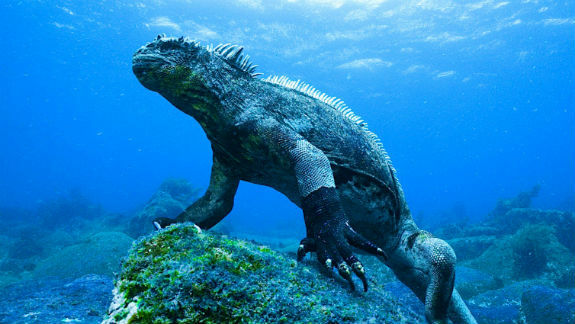 Usually at the beginning of each year, you can find marine iguanas nesting with their babies–and mischievous snakes lurking around. Two diving sites–the first bordering Punta Espinosa and the second, Punta Mangle, located south–offer views of the iguanas, large sea turtles, sharks, manta rays, and seahorses. North and South Plaza make up the Plazas Island aside the east coast of Santa Cruz. The North Plaza is restricted and exclusively used for conservation and research. However, the South Plaza is still an attractive visiting site with remarkable flora and a broad variety of native species to run into. An interesting, endemic perennial herb to the island is the Sesuvium. What is so special about this pear cactus flowering plant is its color changes throughout the seasons–purple, orange, and red in the dry season and bright green in the rainy season. Swallow-tailed gulls and Red-billed tropic birds can be found nesting on the cliffs off the coast. Plazas is another island that land iguanas inhabit and have a large community–marine iguanas are also found on this part of the island–hybrids of land and marine iguanas are common to see during excursions. Baltra island, also known as South Seymour, is a flat and small island that was created by several uplifts of submarine lava. A nice visitor site for travelers is a smaller, flat island just between Baltra and North Seymour Island, Mosquera. Although lacking flora, it is known to have the largest population of sea lions. Its large stretch of sandy terrain allows for visitors to examine their behavior and also the opportunity to see Sally Lightfoot crabs, lava gulls, and coastal birds. Daphne Major is used for evolutionary research and has stringent limitations for those who decide to visit, although,with a permit visitors can see the delicate tuff cone island and animals that reside there.On Daphne Minor, there are no visiting sites for travelers to add to their itineraries. However, both Daphne Minor and Daphne Major offer diving spots with opportunities to observe varied species of sharks, pelagic, sea turtles, sea lions, and eagle rays. What makes the Daphne Minor diving site so special are the benthic organisms that produce multi-colored features on the barriers of the undersea walls of the island. Also, the black corals are inviting to seahorses that wander about. Darwin Island has no inland visitor sites and isn’t typically a tour spot–except for advanced divers of whom are attracted by its diversified marine wildlife endemic to the area. Just southeast off the coast of Darwin Island, Darwin Arch is a small marine site where schools of hammerhead sharks are plentiful and dolphins can be found playing. Being one of the finest diving sites in the entire archipelago, sea turtles, manta rays, and a huge abundance of aquatic fish are observed in the area. Used as a conservation site for eradication of the Little Fire Ant and goats, there are no visiting sites on Marchena. Marine sites in Punta Mejia and Punta Espejo have an abundance of marine animals to observe: Garden and Moray eels, Hammerhead and Galapagos sharks, and bats parading around on the sand. Pinzon Island has no marine visiting sites nor ashore. One nearby visiting point is located south of Pinzon, No Name Rock. This diving site provides views of the usual Galapagos marine animals–rays, sea turtles, Hammerhead and Galapagos sharks, and various species of maritime fish. Known for its most famous habitant, the Vampire finch, Wolf Island is also populated by many sea birds. There is no actual visiting site on land, however, a tiny island called El Derrumbe appeals to some visitors. Recognized by veteran divers for its rich aquatic life, this minuscule island is one of the few that receive cold currents attracting: Green Sea Turtles, various types of rays, and an abundance of fish. Also, different species of sharks such as, Hammerheads, Great Spotted Whale Shark, Galapagos Sharks, and others can be spotted in this area. The initial home of tortoise, Lonesome George, it is also the abode for fur seals, hawks, gulls, marine iguanas, and many more. Although isolated and without inland visitor sites, close by is Punto Neros. Only a spot for a coastal tour, Red-lipped Batfish, turtles, eels, sea lions, and oceanic fish can be detected here. 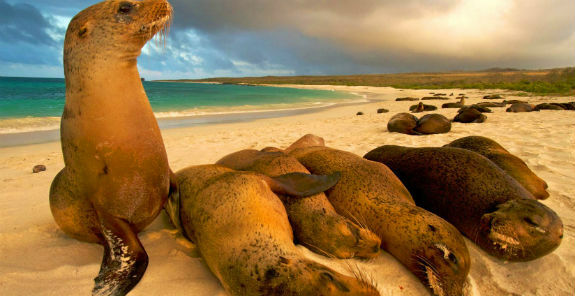 Galapagos Islands is on the top of the list for many who love to travel. The islands just off the coast of Ecuador offer a diversified amount of activities and views of unthinkable fauna and flora. Of course, a trip to the Galapagos takes work and loads of planning ahead of time. Whilst planning, travelers will consider whether they’d prefer to book hotels on authorized islands, or if maybe a cruise might suit them best. Each option has its pros and cons, it just all depends on how one would like to spend their time during their visit. Let’s face it–flexibility is a huge advantage that many can appreciate; land-based island hopping offers just that. For those who feel like their original arrangements might change, or just fellow independent travelers who like going with the flow and want to enjoy inland activities that cruises don’t usually include in their itineraries, booking a hotel may be just what you need. Taking pleasure in the culture and its people is also an advantage of staying on land. There is more time to relish in the main dishes of the islands and get a better understanding of what life is like in Galapagos. Now, not many are fortunate enough to be blessed with sea legs; loosing your sense of balance and trying to avoid seasickness is kind of part of the package when it comes to sea-life. But aside from these slight inconveniences, booking a cruise comes with its own perks. Its convenience for adventurers is a definite plus; a cruise ship will be your home for the entirety of your trip. This means that packing and unpacking is only necessarily done once. These cruises have really perfected their craft so the time efficiency is undeniably up to par. Instead of consuming time on transportation, sailing by night allows for more time during day trips on the islands. A third benefit of cruises are that some islands are disconnected and therefore are only reachable by boat. This gives visitors a much bigger and better perspective of the archipelago. If you’re looking to magnify your experience and check out the majority of the islands Galapagos has to offer, cruising can be the choice for you. Feel like you can’t decide? Consider a combination of both! This option allows tourists to book a few nights on land to island hop and partake in all sorts of daily activities, and then spend the rest of the trip relaxing with the most remarkable itineraries cruises have to offer.